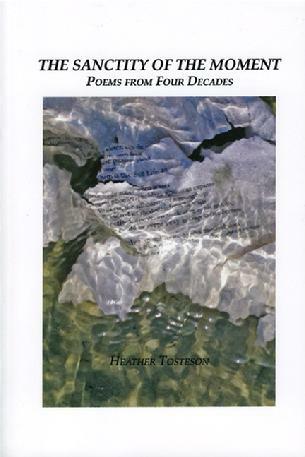 There can be no other poet like Heather Tosteson, no other who strives so genuinely to take so much into account. She sees "every one of us in this world holding/. . .an enormous universe of feeling," and her lines do not describe this universe but mesh with it. She does not witness the world, she bears it. Hers is the grandest and most honorable ambition, to render without violation "life's silky, staining patina." What an immense revelation The Sanctity of the Moment is! How admirable the revealer! - Fred Chappell, Shadow Box, Backsass, Family Gathering, Midquest, winner of the Bollingen Prize in Poetry, T.S. Eliot Prize, and Aiken Taylor Award. The Sanctity of the Moment presents the haunting chronicle of a woman/ mother/daughter/lover confronting both the terrible and the beautiful. Dense, intense, and exquisitely formed, these poems, crafted by a brave and unflinching intelligence, teach us much about struggle, compassion and affirmation. There are hard truths contained within these pages - hard truths and unforgettable writing. Heather Tosteson's poems elicit gasps of thankful recognition: I too have struggled with that anger, experienced that joy, felt that despair, known that sadness. Ms. Tosteson's poetic deconstruction of what it means to see the face of God is fearless. In the instant I finished reading The Sanctity of the Moment, I believed my life had meaning. These poems are more than poems. They're narratives, explorations, and meditations; nightmares, sufferings, and terror. All together they are the makings and re-makings of the central stories of a life - a search for a way to exist. Along the way "on clear days the world / has a definite limit ... just beyond what we thought / the world could hold." We make discoveries, such as that "Purity isn't innocence," and find transparent language (perhaps at the beginning of a prose poem, or a novelistic description) turning translucent. Time and again, I was struck by the brilliance of these poems. Heather Tosteson is first rate. Click here to listen to "Entre L'Arbre et L'Écorce"